Explore the latest in digital content, get hands-on with new technology and take part in a range of masterclasses and workshops delivered by the BBC Academy, Spike Island, Knowle West Media Centre, At-Bristol, Watershed, University of Bristol, UWE and Skills West among others. 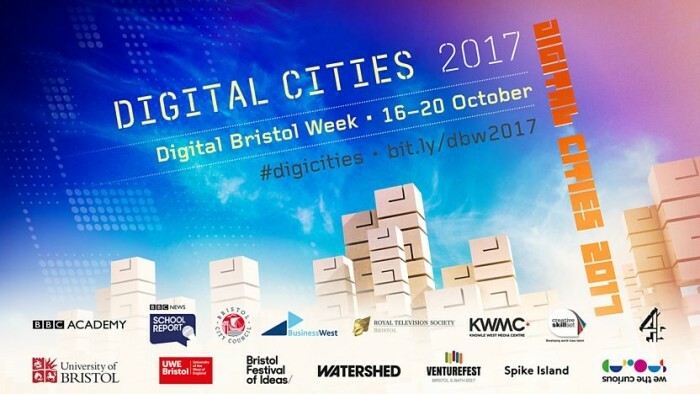 Digital Bristol Week (Monday 16 to Friday 20 October 2017) runs alongside the Festival of the Future City and Venturefest. All three events are joining forces this year to provide a special focus on smart cities and Bristol’s digital innovators and pioneers. Throughout the week there will be opportunities to see the best in film and creative content made in Bristol. Digital Open Doors will give you a sneak peek behind the scenes at some of the city’s thriving creative businesses. Digital Bristol Week also offer opportunities for school students and teachers in the West of England to boost their digital knowledge through tailored workshops and mentoring from BBC School Report. Full details can be found here and you can follow @BBCAcademy and #digicities for the latest information.